Joshua and I first met at Immanuel Baptist Church, the church we both attended with our families as children. Joshua and I were good friends in middle school but we didn’t see each other much after Joshua graduated high school. I started college at the University of Kentucky and one night we ran into each other at a UK basketball game. Joshua made a point to go out of his way to talk to me. I didn’t think much of it since we knew each other well but later that week he started talking to me and we hit it off from there. We have been together for 6 years now and moved to Dallas, Texas together about two years ago. In July of 2016 we had a trip planned to go to the beach with his family. I was certain that he was going to propose there, so my girlfriends and I went to get our nails done the night before we left for the beach. Joshua called me and said that he and his friend were at Community Brewing, one of our favorite breweries in Texas, having a beer together and that we should meet up with him afterwards. We went to the brewery and Joshua told me he was in the back playing games. I went to the bar to get a beer but my friends tried to encourage me to wait until after we found Joshua. I agreed and went to find Joshua before getting a beer. I opened the door and saw Joshua standing with both of our dogs and our favorite song, Tennessee Whiskey, playing. Our dogs had signs on their necks that said “Will you be a Babcock too?” Joshua knelt down on one knee and asked me to marry him. I said yes! We currently live in Dallas, TX so planning a wedding while in a different city could have been very stressful. It was beyond helpful to have family in the wedding business. We decided to make a weekend out of coming home to plan. We visited a few venues in Lexington that weekend but fell in love with the romantic, rustic and intimate feel of Talon Winery. It embodied the feeling of our relationship and how we wanted to share our love with our friends and family. Our first look was very important because sharing that first moment alone and together was very special to us. I also wanted to get sunset pictures on the vineyard and our photographer was very worried we would miss the perfect opportunity. 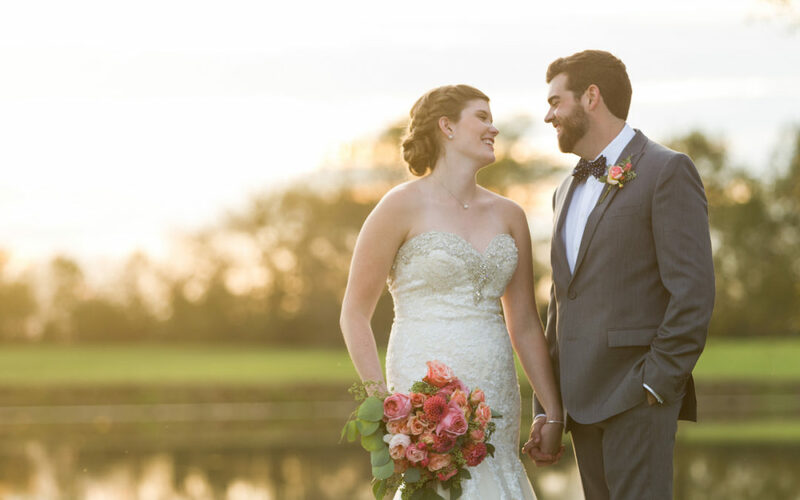 He pulled us out of the reception and we sprinted through the fields to get the perfect picture in front of the pond at the vineyard. Those pictures will mean everything to us forever. Try not to stress over wedding planning. You plan so much and the wedding is over in one day, so take every element of planning and preparation in and enjoy it. Also, enjoy every moment of the wedding with your spouse and do not worry about anyone else!